“Remember you are dust and to dust you will return.” The priest repeated this phrase again and again, fashioning crosses out of ashes on each of our foreheads. As I waited for my turn to participate in this ancient rite, I became overwhelmed with emotion. While the memory that I will die is never far from my mind, this particular liturgy highlights this realization in expansive ways by allowing me to connect with others through the communal embrace of mortality. And this year, wearing a heart monitor to gauge just how compromised my heart had become, I was perhaps even more acutely aware of my death than in some other years. After receiving my ashes, I returned to my pew to kneel with my family, feeling each of those persons closest to me exploring deeply the truth of the words being repeated. And then we all turned our heads to watch the priest walk to the outside of the pew in front of us. Sitting there, connected to an oxygen tank, was one of our community’s elders. Her labored breathing had formed a background hum to the ceremony. Deprived of oxygen, the color of her skin had become gray. She looked like ashes already. She was a visceral reminder for us that death is always present. At the close of that Lenten season, she no longer would be in need of oxygen; I, on the other hand, would be entering into congestive heart failure and would soon be receiving oxygen myself. And the following Lent, I would be recovering from my second heart surgery, and she would enter hospice care. The words repeated during the imposition of ashes originate not in the gospels but in the Hebrew Scriptures. God speaks them to Adam in Genesis 3:19: “you are dust and to dust you will return”. We, like Adam, like all humans, will return to the Earth. Adama means Earth in Hebrew. God breathes life into the Earth to create Adam, symbolically defining our connection with the Earth. We start our lives close to the ground; many of us end our lives again in those same positions. This connection to the Earth is one many of us spend lifetimes trying to forget or overcome. Indeed, all of this attention to falling, to descending, may seem out of place in our contemporary world. Falling connects us with everything that is downward in a world that glorifies upward movement. To travel upward metaphorically (whether that is to “climb the corporate ladder” or to “reach the heights of a career” or to transcend any earthly situation) is better than to move downward. 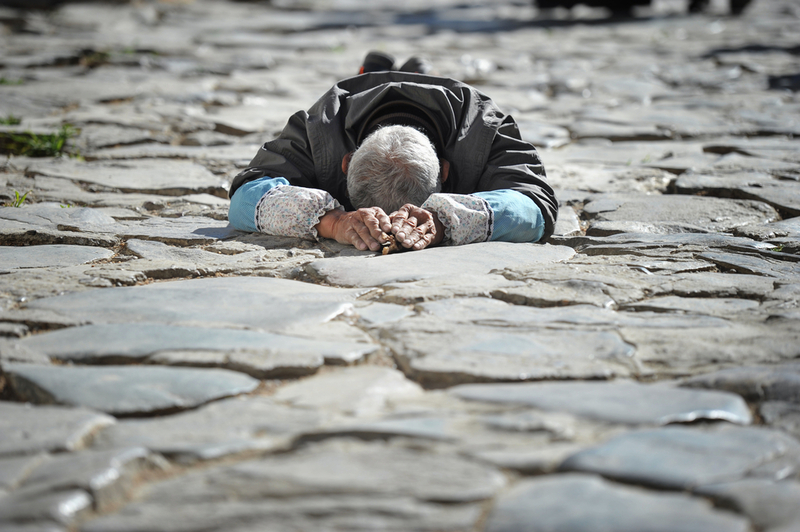 We speak of people having a fall; declining in health, wealth, and status; and descending into the depths of misery. We “lower” ourselves when our situation worsens, but we ascend when it improves. And much of what we receive in terms of spiritual guidance and motivation likewise employs the language of transcendence. Like our medieval ancestors, we turn our eyes toward some Heaven where we will arrive either when we have died (in more conservative circles) or when we have learned to “manifest a better reality” (in some Newer Age beliefs). We attempt to transcend the Earth and our humanity, seeking to move beyond the very substance from which we were created and to which we will return. Ash Wednesday provides an opportunity to remember. The root of the word “humiliation” is humus, meaning Earth; so to humble ourselves is to fall back into the Earth. Jesus knew this, as did St. Francis. Richard Rohr notes that the two adjectives Francis most often associated with God were: good and humble. Rather than humility being negative, as it often is viewed in our culture, Francis “understood the humility (kenosis) and the patience of incarnation”. “God is not found in the soul by adding anything, but by a process of subtraction . . . I advise you to let your own ‘being you’, sink into and flow away into God’s ‘being God.’ Then your ‘you’ and God’s ‘his’ will become so completely one ‘my’ that you will eternally know with him his changeless existence and his nameless nothingness”. Our falls, both literal and figurative, during the dying process allow us the opportunity to be humbled. It is humbling each time I allow myself to experience fully a new level of wellness in my body. During my most recent hospitalization, the baby boy whose brand-new body taught me so much about life and death again was with me at the hospital, towering above me. This time, his baby sister, who would soon also tower above me, was there as well. On Mother’s Day, they arrived with news of his swim meet and her gymnastics meet; I marveled at the strength and agility of their young bodies as I watched my own strength and agility waning quickly. We decided to walk to the family room at the end of my Cardiac Intensive Care Unit to look at the beautiful view of the mountains and to play board games. Although we were only walking 50 feet down the hallway, I found myself needing to take a break at least three different times. Leaning on my IV poles while my family members adjusted my oxygen tank, I wondered if I would ever walk without these devices again. It is always humbling to find myself so ill, but such humility is not only available to those of us with weakened physical bodies. 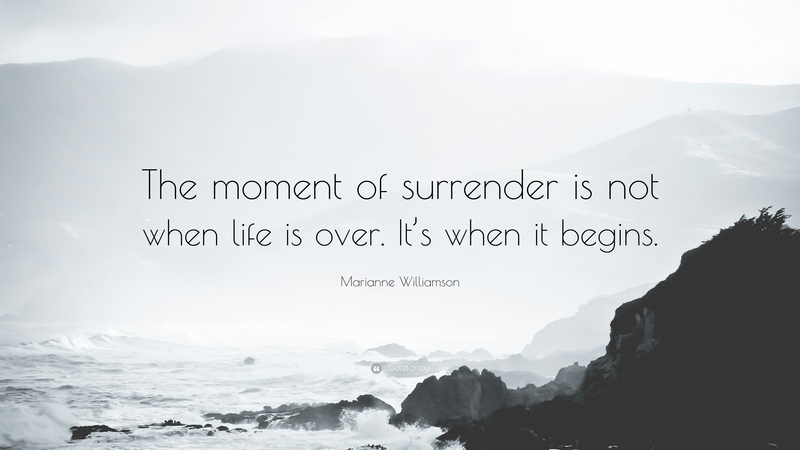 We each encounter a multitude of opportunities to remember that we will someday return to the earth; we can use each of these to practice the art and gift of surrender. I pray that I continue to allow myself to be humbled; may this movement downward – this path of surrender – last much beyond the ashes that are placed on my forehead. And may I offer myself to be humbled, to be emptied through the practice of surrender, so that the dualisms of Heaven and Earth, up and down, good and bad disappear.